So yes, as promise this would be my post about my experience with Dr. Ko. Here's what happen. Last year around November till December 2014 I have been using some products and it cause me major breakouts. I also have been stressing alot and drinking 3 in 1 coffee alot. I got myself to blame. You can really see how my skin really are live between my two videos. Before treatment in the Dettol video and after treatment in the Planner review video. I always have these kind of moment. a few months my skin is good and after that my skin goes worst. It is because as a beauty blogger and am taking the risk of trying so many skincare products. Some of them help we with the healing process some just don't. But sometimes these products takes months to really make my skin heal back. So another fast option is by visiting professional skin specialist. Dr. Ko billboard is everywhere. I bet you are familiar with this. Glad I got the chance to experience myself with this kind of professional treatment who knows the real science of a good skin. They are available in most state and since I am in Johor, I made an appointment at the Dr. Ko Taman Pelangi branch. The major problem that I am lookign foward for this treatment is to help reduce my season acne problem + acne scar problem. A little bit of introduction, Dr Ko Skin Center is basically a place where they provide aesthetic and non aesthetic beauty treatments. You can check the whole list of what service they are offering. 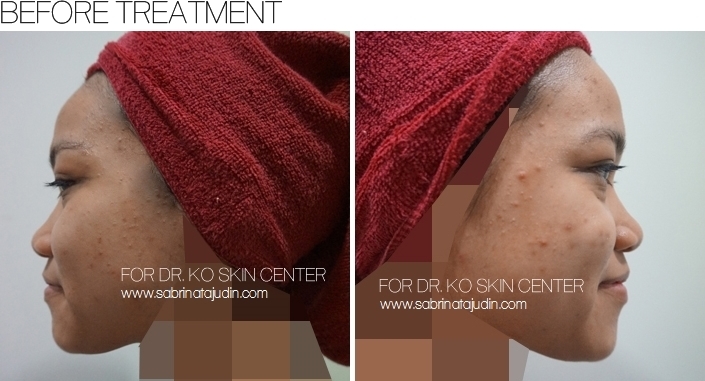 More about Dr. Ko Skin Center click here. As I arrive, I was greeted nicely, everyone were very welcoming and the clinic it self is pretty nice. I waited for my consultation turn. Before I went to any kind of treatment I tell them about my skin problem. After that they check and explain what is the skin problem I have been facing. Also I feel so honor for them to actually call Dr. Ko himself for him to see my skin problem. They video call Dr. Ko as you can see in the picture above and Dr Ko himself analyze my skin and let the beautician confirm about what treatment I should get. 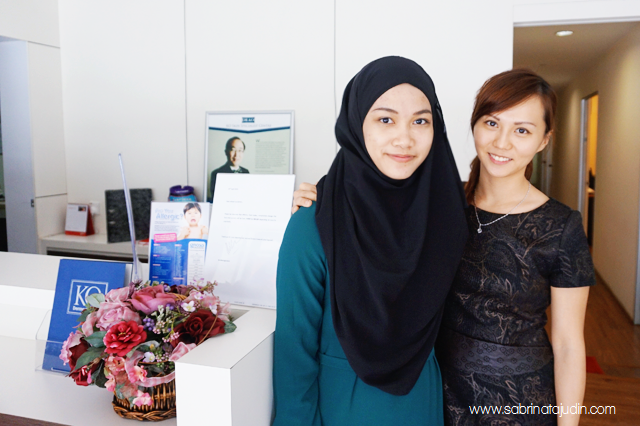 The main branch was located at Klang and there is where Dr. Ko is available. First they help to remove my makeup. It was the most relaxing part till I realize the next treatment I am getting is the tiring part. Haha. The first treatment I got after they remove my makeup is called "Extraction". I think that is the name. Basically they will remove ALL impurities and stubborn dirt on my face. Here what you have to know how the situation goes. I wore makeup since 18. Imagine, all of the makeup I pile up on my face that is stuck inside my pores. Cleansing alone wont help, and actually we have to do skin extraction at least to my opinion 2 times a year just like scaling your teeth. I never knew about this and just realize how this change my whole skin condition. What she actually doing is the uses this some kind of tool and "extract" out all the dirt from my face. It pretty painful but bearable. Just for 45 minutes, after that I surely feel that you will feel the satisfaction of realizing all the black heads, whiteheads, and clogged pores has been extracted out. This also help to make skincare works better on my skin. After that they cool it down my face with this mask that harden after a few minutes. I can't remmember what is the name of this treatment. But I kinda love it! It's very soothing after the painful situation I got earlier. Haha! The reason why it is too painful to my opnion is that it was my first time. So after this, it will be less painful. hehe. The third treatment that I got is called the Dual Light Treatment. This is where they will work the "light device" against my face. It is actually very warm. So before that, they apply this kinda like gel to my face before using the light. 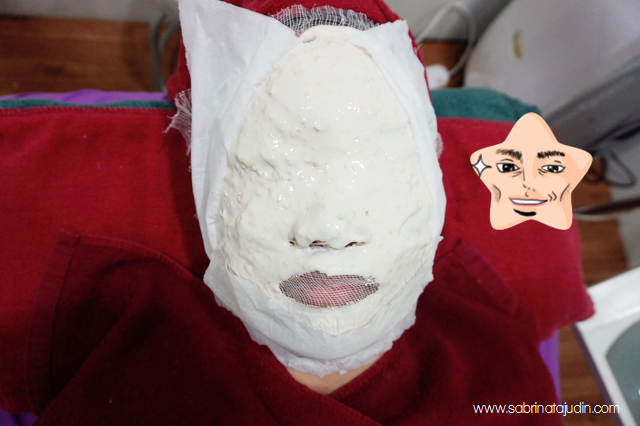 This treatment is meant to help reduce my acne scars and helps to brighten my skin instantly. So brightttt! This treatment is not painful at all. Here is my tired face. Haha! My bare face after the treatment with only brow makeup. Lol. Still want to put some makeup hah sabrina. Yalah, need to drive back home ma. Must look a bit fancy. After the treatment, they also gave a a full set of skincare to e use. You can read it out here - Ko Dermacare Skincare Products Review. It is meant to be a good product to be use after this treatment so the treatment goes along well. So here is my unedit raw picture of my bare skin. Before treatment, I have this small cyst & bumps around my face and my skin is between too dry and too oily in some part. It is really not the best time of my skin during that time. I was so stressed! After the treatment my skin looks very "red", it must cause by the extraction I did earlier during the treatment. And if you notice, my skin is actually brighter. This is because of the Dual Light Treatment benefits. Bare in mind that both of these pictures are taken in the same lighting and venue. I do see a lot of difference here! After a few weeks of using their products and after the treatment. My skin has been continuously become better and better. So far straight from my heart I got to say I am really satisfied with Dr. Ko Service. They really know what they are doing and I love how they consult me with the best treatment that I could get. Although I am a beauty blogger, my knowledge about skin is not as good as a real beautician who spend years of study these topics. This treatment is yes provided by them but I am not paid to said only nice things about it. I've been to some aesthetic treatments before and I found that Dr. Ko is by far the best. I am looking forward to have more skin treatment with them in the future. So got to work hard while I am young now to get the best skin treatment when I reach my 30s 40s years! hehe. I glad that the clinic is really near to my house here in Johor. For price wise, it is better for you to go and consult with them first because they said each skin problem has a different type of pricing. Don't worry, they are very professional and I recommend you to get consultation from them first on what is your skin problem is. In shaa Allah (with God wills) they are able to help with it. They are doctors! Also there are other options other than facial treatments, you can try products that help to remove acne scars such as this best scar removal cream. **I only go for 1 treatment, no follow up treatment. This post is dedicate to one treatment only and after that I use their skincare products for 1 month only. More info do contact them, I am not a doctor. This experience are from my own personal experience and my skin type. Extraction & Salicylic Acid Treatment - RM180. Masque application is optional RM20. 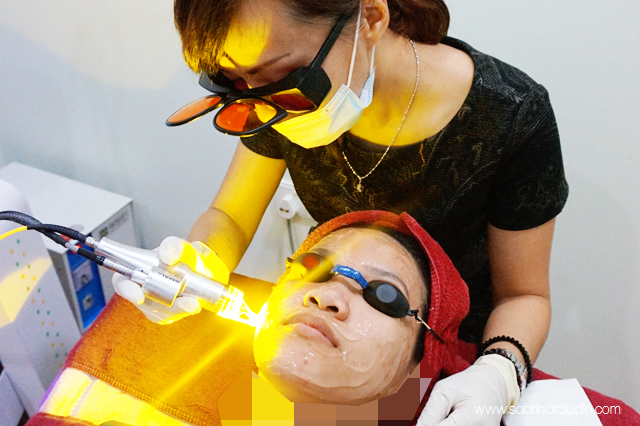 The Dual Yellow Light treatment ranges from RM400-RM800 depending on your skin condition. Do check out Dr. Ko official website and Facebook for more info and updates. ** I RECEIVE TOO MANY EMAIL/MSG REGARDING THIS REVIEW. I HIGHLY APPRECIATE IF YOU COULD READ THIS POST PROPERLY AS ALL OF YOUR QUESTIONS, THE ANSWER ARE IN HERE. SO I MAY NOT BE ABLE TO REPLY ALL OF YOUR MSG DUE TO TIME, PLEASE READ BELOW FOR MORE INFO. I only use their skincare for one month after this treatment, and after that I use other skincare. Saya hanya mengunakan skincare DR ko selama sebulan selepas treatment ini, selepas itu saya menggunakan skincare lain. Anda perlu menambah pembayaran jika mahu kan skincare mereka. Regarding the price, it varies from each type of skin problem. My price are as above, my skin problem are just hormonal acne and not major acne problem. Mengenai harga, harga tidak tetap dan ia bergantung pada jenis masalah kulit setiap pelanggan, harga yag tertera diatas adalah harga untuk masalah kulit saya iaitu jerawat hormon akibat stress dan pemakanan, bukan masalah kulit berjerawat yang kritikal. Ya, saya mengesyorkan service mereka kepada anda sebab saya berpuas hati dengan service mereka. You can call them to know more details and make an appoitment, phone number and contact info are listed in this post above. Anda boleh menghubungi mereka seperti maklumat yang tertera diatas untuk tahu lebih lanjut dan appointment. Great! Love to see that your skin is improving..
wow..tremendous improvement!! happy for you :) May I know the price range though of the treatments? Lamenye xsinggah sini...haih bz bz...anyway...interesting topic...acne makin banyk sbb slh amik supplement...mcm nk singgh je Dr.KO..anyway..Sab tunjuk gamba muka bnyk acne pun cantik je...jelly laa....kalau iqa..mau org tutup browser nie..
well.. that was the risks when we try so many product out there.. I have been through that worries moment too when my skin look so worst ever.. Healing process takes time..
ah, the risks we beauty bloggers take in the name of passion. i've heard nothing but good stories about Dr.Ko branches and I myself have been planning to only consult them if i come to a time where it is necessarily needed for my skin :) thanks for the review sab! Perasan kan? Billboard biru tu haha! sis, do write up bout current condition now lepas guna semuaa.. nk tgk.. If you dont mind sharing did u have to pay for the appointment as well? From ur experience. hi.sya nk tnyalah,msatu sya ada pgi ke klinik dr ko. about acne also.tp dr to suggest sya makn 2 jnis pil,face wash and krim untk pkai malam je. dia xsuggest sya beli brg untk luaran pn sprti yg awk belilah..is it ok? Hi sis :) May i know how much you have spent for all this treatment? Do you still use Dr. KO products and follow up with him? I heard that they also provide special offer in treatment package. What package did you use? How much the cost fee for consultation? Hi ! Just want to know how much you spend in this treatment ? because i want to prepare the amount of money that i should bring . Hehe. Or do u can suggest how much should i bring? sis..sy nk tya..muka sy nie trk sgt,byk keluar jerawat..muka rasa mcm bengkak..blh ker sy pg jumpa doctor ko..
sis.. do i need to make an appointment first before go to the clinic? Hi Sabrina. How many sessions of facial did u do? And how long is the face care products last for? I only did one session and the skincare could last you probably 2-3 months. Salam, nak tanya. Untuk skin like u berapa u habis untuk semua? U punya total cost semua? Hi sabrina, the full set of skincare that they gave you after the treatment is it free or you have to pay also ? it was given to me aftr the treatment, you will need to purchase it. It is optional. 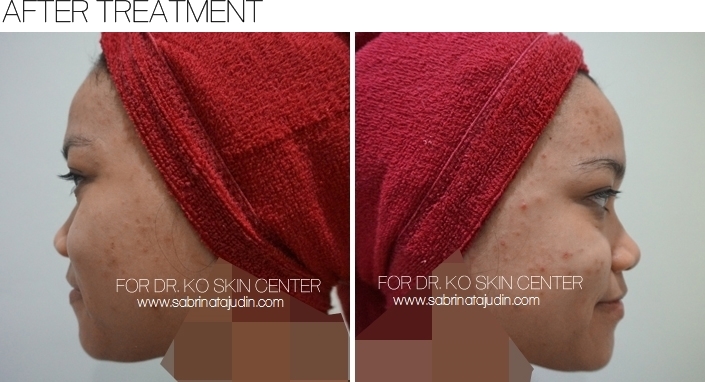 Hi sabrina, i nak tanya laser treatment yg u pakai tu untuk pudarkan parut jerawat dengan kecilkan liang pori muka ke? I teringin nak cuba tapi setakat ni tgh mencari feedback customer pasal DR KO ni. Takde student price ke? huhu tq sebab respon. "This treatment is meant to help reduce my acne scars and helps to brighten my skin instantly." tak sure dear ada student price ke x, kene tnya klinik tu sendiri. kak sab cuma dtg and menerima rawatan sahaja. I buat treatment ni sekali je. Mmg dia suruh follow up and make another appointment but I did not go. I just went for one session (this treatment in this post) and yes sepanjang 2 weeks after treatment mmg i pakai skincare dari Dr Ko. then thats all. i did not use their skincare anymore since i am a blogger, i need to try other products for review as you can see from my latest post. If period boleh tak ambil pil purple ? hi dear, saya bukan doctor, better ask their (dr. ko / org yg suggest makan pil tu) for guidance about this. Hai sab. I hve cnfdnt to get tteatmnt frm dr ko aftr read your entry. Thanks to u. Tmrw i will get extraction treatmnt. After doing this all your whitehead and blckhead gone forever or not ? usually 1st extraction will give you redness and there will still be whiteheads and blackheads. continue to exfoliate and take care of your skin after getting this treatment. forever or not forever it really depends on your lifestyle too. Make sure to take proper skincare steps after getting this treatment to make sure it last long and keep your skin healthy. best to follow the doctor advise, i am not a doctor and my skin may be different from you. hai sab, u pergi treatment tu just once je ke? or ada lagi following treatment? just once (which is this reviewed treatment in this post) tak ada follow up treatment. after this treatment i just use their skincare and take care of my skin properly. also after a month plus, i stop using their skincare sebab continue to test other skincare for my blog review. the price that u stated above is it include the product that u purchase or not? Hi Sabrina !! I would like to ask your permission. Do you mind that I use your post for my assignment research about cosmetics and skincare? Salam.. kalau parut berlubang dr ko boleh rawat tak?? Which Dr. ko branch u go? product tu dpt lps rawatan ke? and 1 lagi the skincare yg dpt after trearment tu complimentary or kena beli..how much for de whole set? Wasalam dear, harga ada tulis diatas. Yes, sab pergi sekali sahaja seperti review diatas. skincare kene beli jika mahu. ada tak kena makan ubat yg pil? other than using the products? Dia ada bagi tapi Sab tak makan. Lepas treatment ni just guna product Dr Ko selama sebulan je. T.kasih utk info sbb br bercdg utk dptkan khidmat drp klinik ko di tmpt sy disbbkan masalah kulit muka yg sama spt puan.Thanks a lot!! Hi sab, nak tanya kalau buat consult tu ada fee juga tak? Berapa agak2? Sis. Pill purple tu sis tahu tak price dia? Hey there. I'm currently working in Dr Ko clinic and the pill purple name A10 is RM 8 per pill. For one month supply is 180 ya. Nak tanya . Da okay semua . Tak pegi balikkan .? And ,pergi jumpe dia berapa kali . Ke sekli je ? ?